Let us have a quick poll here – or rather, a quick show of thumbs: How many of you out there have actually engaged in a bout of thumb wrestling back in the day when you were a carefree kid? I am quite confident that this is one experience that has not been lost on the masses, and kids these days do still practice this game although we are losing more and more of them to the digital revolution. 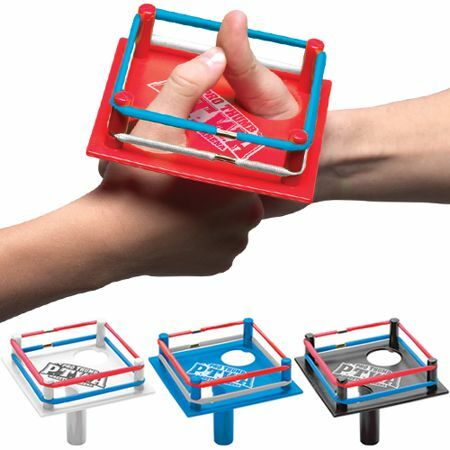 Why not spruce things up a bit more with the $6.99 Pro Thumb Wrestling Arena? This is a full-size, officially sanctioned professional thumb wrestling ring. All contenders will need to insert their thumbs through the opposite corner holes, and you will have to provide your own announcements as well as entrance music for added effect. Each purchase sports real turnbuckles, flexible ropes and a high impact shock resistant power grip handle. I wonder when will someone invent the tag team format for thumb wrestling.